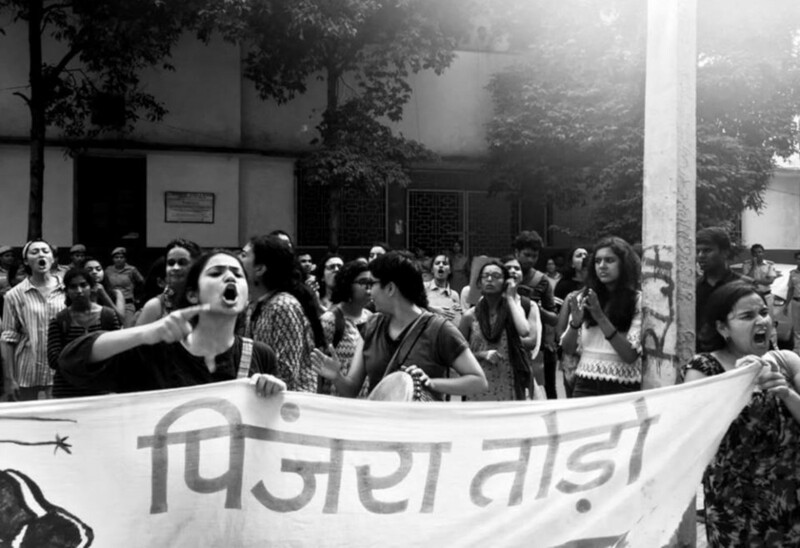 Pinjra Tod is an autonomous women’s collective that started in Delhi, which, amongst other things, fights for affordable, non-restrictive and non discriminatory accommodation, aiming to change the face of the public university, as such, through these questions! GroundXero interviewed two members of Pinjra Tod at Jamia Millia Islamia earlier this year. In this article for GroundXero, some members collectively write about the wave of protests organized by them over the last two months. 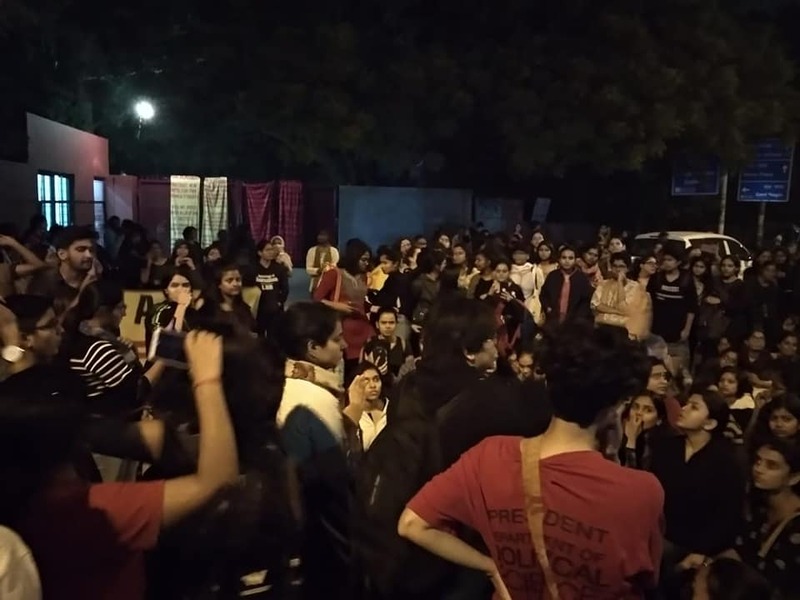 The last 2 months have seen an upsurge of women students across the country protesting against discriminatory rules and regulations, fighting for a more accessible and equal university. Pinjratod has been organising for 3 years now across campuses in Delhi, and we have been a part of it as members. The struggles of women students in Mumbai University in March ’17 and BHU in October 2017, and the more recent protests in RIE (Regional Institution of Education, Bhopal, Ajmer and Bhubaneshwar) in August, 2018 have brought the question to the forefront yet again. Simultaneously, that Hidyatullah National Law University students were fighting with similar set of demands, and then further extending the struggle to demand the resignation of the VC on account of fund embezzlement, was greatly enthusing for us. Not only this, but the fact that women students fought and won at Panjab University, Chandigarh after a 26 day hunger strike, during which they were attacked constantly by ABVP, forces us to confront the political import of the moment. 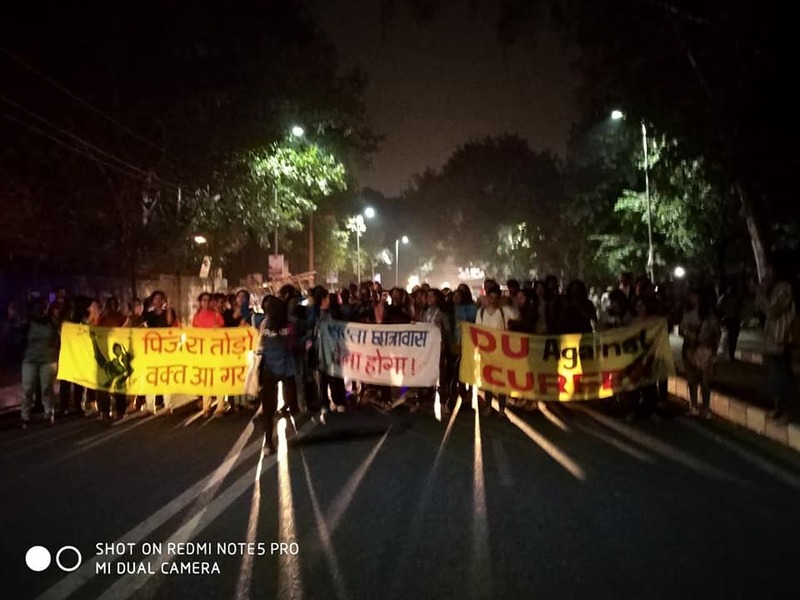 Students at Panjab University at Patiala, led by the first ever woman President of the student union, Kanu Priya has built upon the struggles of the last few years, defying curfew every night and taking out marches. They have had us chanting with them, ‘Death to Patriarchy’. This has made the questions that much more urgent to raise as the public university education system and infrastructure continues to replicate familial structures of control and surveillance, constantly redrawing the boundaries of accessibility to education while the exterior facade of equal numbers remains intact. The anxiety around women becoming autonomous subjects, accessing public education and the cultural, social resources of the city stems from an anxiety around transgression of social boundaries. The possibility of a woman being able to make her own decisions and/or falling in love with someone across the lines of caste, class, religion or ethnicity is at the core of these practices. 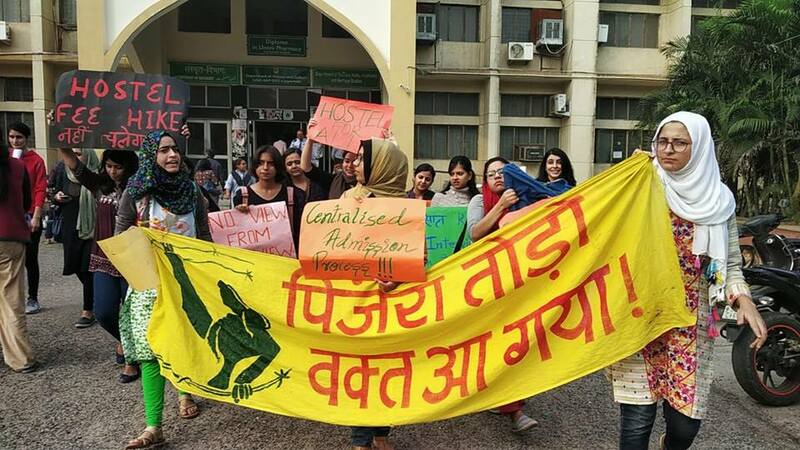 Effectively, the university not only restricts the mobility of women students, but denies opportunity to women students to earn money and fund their own education. Not only this, women’s access to the university infrastructure and resources such as the library, labs, sports facilities etc remain limited and conditional on account of these discriminatory practices. The ‘DU Against Curfew’ campaign was re-initiated by Pinjratod, campaigning through colleges and rediscovering yet again how despite the small extensions of an hour here and there, the conditions remain the same if not worse with fee hikes and policing of political expression, the non participation of most women’s colleges in Delhi University Students’ Union elections is just one such example. We re-submitted our Charter of Demands to the Proctor’s oﬃce and the Dean of Students’ Welfare oﬃce, calling for a protest meeting on the 8th of October, expecting the Proctor to come and speak with us. The protest was attended by students across colleges in DU and yet the administration shut its gates when we proceeded to the oﬃce. Enraged at yet another locked gate thrown in our face when the struggle is precisely against this, students climbed over the gates, after which the Proctor was forced to come out and address us. However she refused to engage with us and left in 2 minutes after a token response of considering our charter. We decided to continue the protest and blocked the Mall Road, in a symbolic and powerful act of protest against the practice of immobilising women students every day of their life in the University. The police deployed RAF and water canons, roughing us up, bending our arms, pulling us, pushing us over, they left no stone unturned to disrupt our protest. But the students stood their ground, reasoning with the public around regarding why we chose to protest in this manner. Finally, the DU admin buckled under pressure and came out to meet us, wherein they spoke in vague terms of being committed to creating a non-discriminatory university, and yet failed to give us an answer as to how these rules had been in place for so long or with regards to action towards fulfilling our demands. Since the Dean had asked for 2 days to give us a better answer, we continued with the night long protest, singing songs, painting, sharing stories and slogans, recreating the public spaces of the university as per our imagination. Owing to their non-committal response, PinjraTod decided to call for another protest on 10th of October. The enormity of the impact of the first protest was enough to shake the administration, so much so that the RAF and Water Canon Tanks were deployed once again on the protest site. 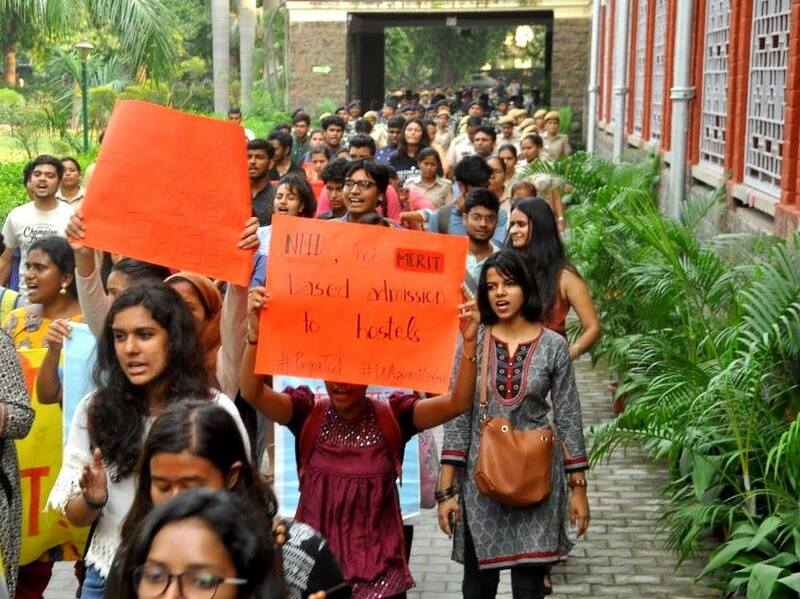 Undeterred, women students marched from Arts Faculty to Stephens, Hindu, Ramjas, Daulat Ram College, Miranda House and Khalsa – breaking their gates as a symbolic act of the movement and what it stands for, rousing the students with slogans, many of whom joined the march. When we marched to Miranda House, the sloganeering of the protestors managed to get the Principal Dr. Pratibha Jolly, to come meet us, which was appreciated given the otherwise apathetic behaviour of the administration, which completely refuses to engage with students. During the conversation, the principal agreed to a host of our demands that included ensuring safe drinking water, allowing 24*7 food delivery to the hostel, not giving the warden powers to call up residents’ parents without their consent, allotting oﬃce hours of wardens and delineating exact responsibilities so that they do not overstep their role and morally police women residents. However, she said that on the issue of removal of curfew, she would have to conduct meetings with the Hostel Committee to arrive at a decision. Following this, the protestors gave her a deadline of 30th October to implement the decision, failing which women residents of Miranda House Hostel would defy the curfew and sit outside the hostel gate in protests upon partial fulfillment of demands, on the 30th October. Using this as a deadline for the University, we declared a protest, having given the DU administration enough time over the years to deliberate on our demands. At Khalsa College, women in their balconies shout slogans along with protestors, at 7pm. Preceding the protest on the 30th, we waited in anticipation to hear from the administration about the changes, however nothing came forth. Around 10pm on the 29th, we heard that the Miranda House administration is in a closed door meeting with the hostel union and is likely to bring a notice eﬀecting the desired changes. The notice that came out, however, was worse than expected and insulting in it’s attempts to appease students. It oﬀered a relaxation of half an hour on the curfew timing, increased the number of late nights by making all weekends available for taking night outs, and tweaking the rules in such a way that eﬀectively for 15 days a month, one could step out and come back at any time (meaning no curfew). These changes were brought in stages, creating confusion and as a result of students’ non acceptance of these ‘peace oﬀerings’. The protest on the 30th began by a demonstration first at the Proctor’s oﬃce, waiting for their response. The oﬃce put double locks and gates in our face this time, refusing to communicate with us. Some of us had tried to meet the Dean and the Proctor earlier in the day to invite them to come and address the protest gathering, and inform us of the developments since. The oﬃce told us that the earlier Dean had to resign in relation to Ankiv Basoya’s fake degree row, and the new Dean had been appointed days before and did not yet have access to even the oﬃcial email id of the Dean. The Proctor, on the other hand, outright refused to engage with Pinjratod. The Dean came to the demonstration and addressed us for a few minutes, using the excuse of having been appointed just days before and left us promising that they will have meetings with concerned bodies. 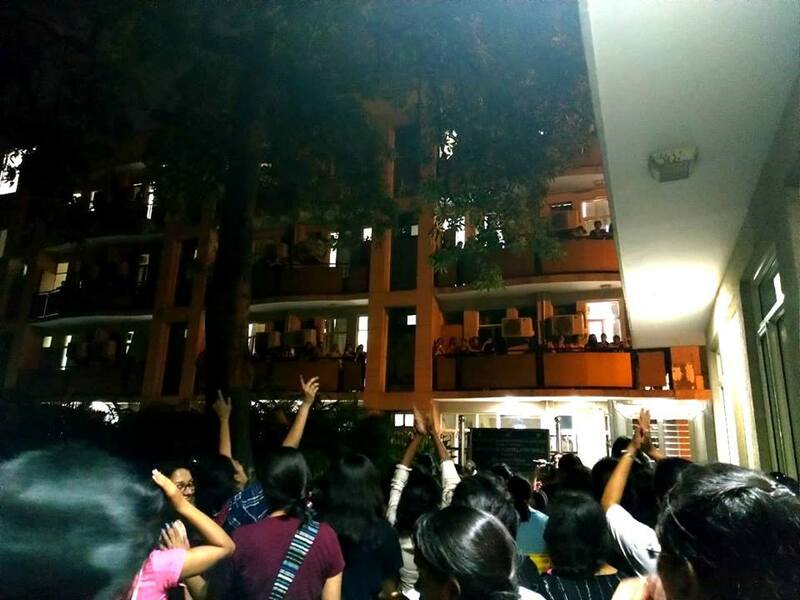 Before proceeding to Miranda House, students decided to put up a lock from the outside this time, locking up the administration that locks up women students every night and makes tall claims about wanting to keep the University free of discrimination. As we approached MH hostel gate, carrying the ladder with us, we found the gate closed upon us yet again, and at least 2 hours before curfew time, also thereby locking up MH students from participating in the protest. After a loud demonstration, the Vice Principal came to address us. She tried to establish that the changes that were being brought about were a step in the right direction and were a marker of the progressiveness of the MH administration – only to meet a resounding no from the students who said out loud, “Too little, too late!”. Students occupied the MH hostel gate through the night, defying curfew, and decided to boycott attendance through this semester as a form of protest till their demands are accepted. We were joined by friends from Panjab University and BHU, who shared inspiring stories of their struggles and joined in protest that night. Meanwhile, the Principal was spotted the next day in college and students confronted her about not being present to meet the protesting students the night before, as had been promised. She attempted to silence and intimidate the students by calling them rioters. LSR students meanwhile also declared a protest for the 5th. In a similar turn of events, an urgent GBM was called by the admin a night before and an oﬀer to extend the timing of late nights by half an hour was made. The admin, however, refused to engage with the other demands made by students. Students persisted and protested the next day. A huge number of students joined in, and we protested outside the gate asking the Principal to address us, as had already been requested while submitting our Charter of Demands. After a prolonged wait, students took to blocking the roads outside LSR and then moved ahead to block the intersection for half an hour, chanting slogans, asking the Principal to come out and talk to us. Finally, she sent word that she would. She came to the LSR gates, and spoke a few words, asking us to stop protesting and refused to hear us out. Pinjratod decided to occupy the gate through the night, and we ensured that the hostel gates also remain open that night and no attendance was taken. We protested through the night, with poetry, songs and music while the admin continued to ignore us despite the fact that they live inside campus. From the very next day onwards, the administration proceeded to come down heavily upon students, punishing them for having protested. They tried to evade the question of implementing OBC reservation, scoﬃng at the idea of subsidised public education and calling individual students to their oﬃce, sometimes asking them to write apology letter for campaigning inside hostel premises. They even called parents of 3 students to threaten them with expulsion from the hostel or concoct other complaints about ‘indiscipline’ and underperforming in college. They finally settled upon declaring that the demands would be accepted with a fee hike of upto 36 thousand (LSR hostel fee is already around 70k p.a.) annually. Why? To be able to implement OBC reservation and to install revolving doors and biometric attendance system infrastructure in the hostel. It was a clear attempt at dissuading students from persisting with their demands. Concerns about consultation with parents regarding hostel rules are always thrown out of the window when it comes to fee hikes, since administrations of colleges in DU thrive on humiliating students for asking questions and for striving to create a more enabling public education system. They wish to create a university that is only accessible to a few. The MH administration also set an example in this regard, when the Principal called a few of the students from the hostel and threatened to charge them with false complaints for ragging inside hostel. And for what? For having campaigned inside the hostels and having spoken to students regarding the logics of the demands. The LSR admin, not content with what they had done, even asked students to not hold GBM’s and meetings inside the hostel because apparently it was impermissible for a student to call for a meeting to sit and discuss issues with people living in the same hostel as them. 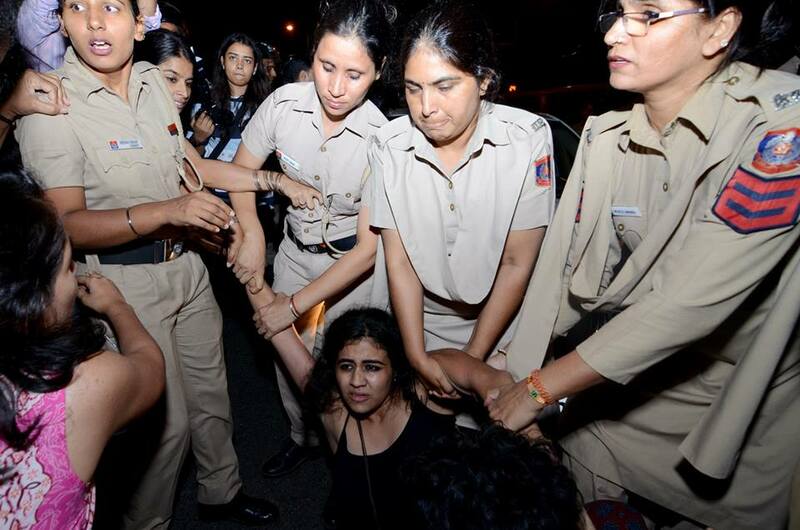 The intent of the college admin and DU admin at large is made clear when they seek to curb dissent and attempt to create apolitical spaces inside college and hostels, when they brand women students as rioters for demanding a more equal and accessible University. At the same time, we have been following the developments at CURAJ University, Ajmer where 10 students were thrown out of the hostel at night, without any notice, for having protested against the biometric attendance system (which is only in place in the women’s hostels) and moral policing, restriction of access to library and other University resources. The case is now in Court and the message to the University from students is more than clear this semester. We are not stepping back, we will not be deterred and we will not accept these humiliating practices any more. Two weeks later, Pinjratod organised a protest in Jamia Millia Islamia protesting fee hikes in the women’s hostels and delays in allotment of hostel seats that have had women students inconvenienced this entire semester; being asked to stay on guest charges in their own hostels, then asked to vacate at a week’s notice and find accommodation elsewhere and then not given hostel seats and humiliated in interviews. The fee hike as of now has been rolled back, while other demands of doing away with the interview process and implementation of a better deprivation points system for admission into hostels is still in process. The time has come for the public university system to provide aﬀordable, non-discriminatory accommodation to women students to enable and further access to higher education. There have been movements and collectives in private universities as well. However, as a movement we have operated in the public university system, and our demands are integrally linked to the public university. It is important to ask for more accountability from the dying public university system, and it sets a precedent as well. It is time that the perpetuation of familial surveillance and brahminical patriarchy so deeply embedded in higher education be wrenched out. It is time that the university responds to calls of social justice and implements its own policies. We draw immense inspiration from all the struggles that have happened across campuses, the dots have been connected, and we will not settle for anything less. Women students in this country have truly had enough, and we will not be backing out from this fight in the coming days.